Yesterday, a week after the celebration of the Assumption, was the celebration of Mary, the Queen of Heaven! So, in honor of that, I’d figure I would post an intriguing pair of paintings by William-Adolphe Bouguereau that feature the Virgin Mary and Christ together — but in completely different circumstances. The first painting is his Pieta, which features a haunting picture of Mary, in her role of Our Lady of Sorrows. She her son, Jesus tightly in her lap with angels surrounding her, and looks out at us, just like so many pictures as Madonna with Child. But there’s a problem — Jesus is dead. He sprawls across her lap, his head lolled back, the Crown of Thorns on the floor. And Mary sits there, her expression is tormented, her tearful eyes focused on us, as if to ask us why. 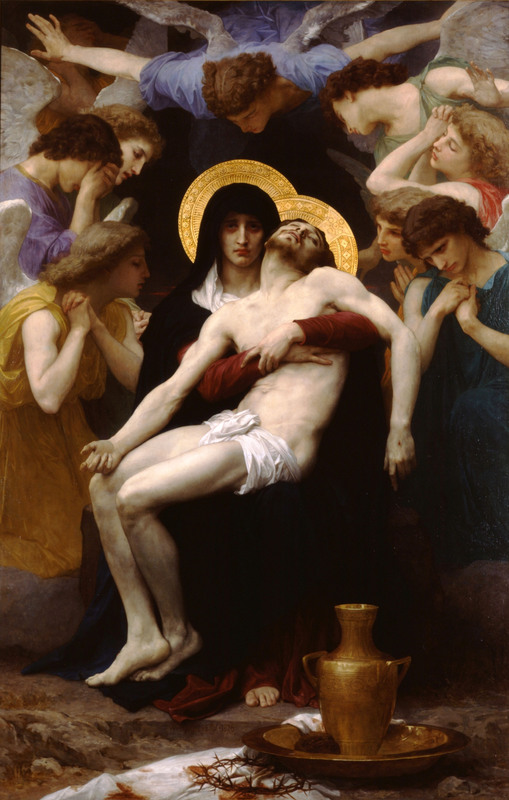 Pieta, by William-Adolphe Bouguereau, c. 1876. Legion of Honor, Fine Arts Museums of San Francisco, San Francisco, California, United States. The second picture is very much like this picture in many different ways. Mary is holding Christ tightly, wearing similar clothes. Angels surround her. But, this time, Christ is alive, reborn again as the Christ child, and all is bathed in Heavenly glory. The angels, no longer in common clothes, are dressed in white gowns, embroidered with gold. Mary’s clothes are also now embroidered in gold, for she has been crowned queen, and stars surround her head to announce her queenship. Her eyes are turned down, but she is looking at Christ. And this time, Christ looks at us directly, with an unfathomable expression. His hands are outstretched and His right hand is held up in a sign of blessing or benediction, with two fingers and a thumb up and two fingers down. Regina Angelorum, by William-Adolphe Bouguereau, c. 1900. Petit Palais, Paris, France. 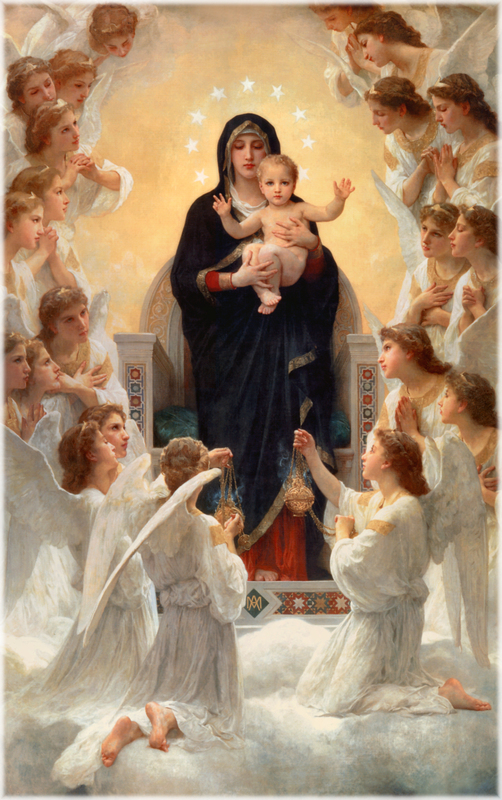 Anyway, to honor this special day… let’s pray a very old prayer, the Salve Regina, or Hail Holy Queen!